It’s 3:00am. Do you know where your husband is? Meet Will Rhodes: travel writer, recently married, barely solvent, his idealism rapidly giving way to disillusionment and the worry that he’s living the wrong life. Then one night, on assignment for the award-winning Travelers magazine in the wine region of Argentina, a beautiful woman makes him an offer he can’t refuse. Soon Will’s bad choices—and dark secrets—take him across Europe, from a chateau in Bordeaux to a midnight raid on a Paris mansion, from a dive bar in Dublin to a mega-yacht in the Mediterranean and an isolated cabin perched on the rugged cliffs of Iceland. As he’s drawn further into a tangled web of international intrigue, it becomes clear that nothing about Will Rhodes was ever ordinary, that the network of deception ensnaring him is part of an immense and deadly conspiracy with terrifying global implications—and that the people closest to him may pose the greatest threat of all. It’s 3:00am. Your husband has just become a spy. CHRIS PAVONE is the New York Times bestselling author of The Expats and The Accident. He is the winner of the Edgar and Anthony awards for best first novel. He was a book editor for nearly two decades and lives in New York City with his family. New York Post "Best Books of 2016"
St. Louis Post-Dispatch "50 best Books of 2016"
"The Travelers does confirm what Mr. Pavone’s first two books have established: that when it comes to quick-witted, breathless thrillers that trot the globe, his are top-tier." "A Hitchcockian thriller… [Pavone] brings on a full slate of characters, sharply etching their dress, their moves, their motives, all the while evoking the world they occupy." 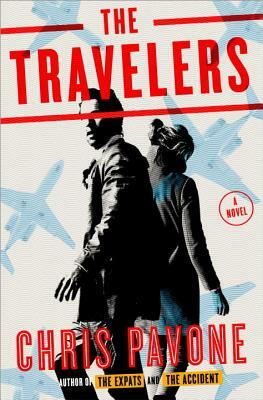 "Pavone continues his run of smart, elegant thrillers with The Travelers...written with wit and charm as well as satirical brio." "Pavone established himself as a highly adept weaver of complicated tales of deceit and danger with an international backdrop and a seemingly innocent central character. This latest is his most effective to date." “The Travelers moves at a brisk pace as Pavone ratchets up the action-packed suspense and infuses his plot with a rich view of far-flung exotic locales…With insight and a bit of wry humor, The Travelers will have readers wondering just what does he do all day?